Environmental education and sustainability have deep roots at Kalamazoo College. Now, they’re set for an era of new growth. 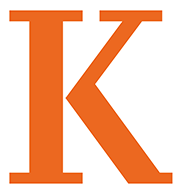 The Center for Environmental Stewardship, which got its start during the 2010-2015 Campaign for Kalamazoo College, will take a giant leap forward with a newly announced $250,000 grant from the Arthur Vining Davis Foundations. 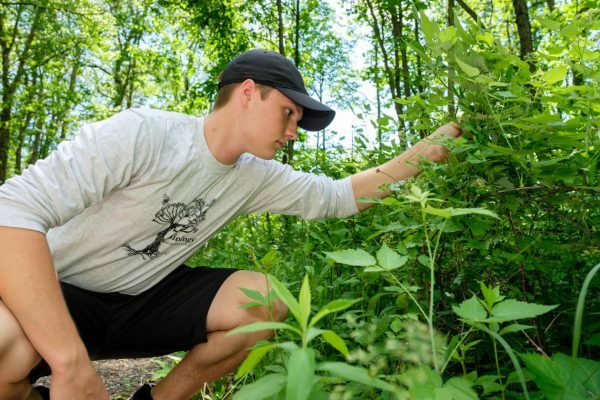 Examining a patch of Oriental bittersweet, an invasive plant, Mathew Holmes-Hackerd ’20 makes use of Kalamazoo College’s Lillian Anderson Arboretum as part of a research project. A $250,000 grant from the Arthur Vining Davis Foundations will help the College spread environmental education and sustainability throughout its curriculum and make wider use of the Arboretum via the Center for Environmental Stewardship. Increase sustainability and environmental stewardship across the curriculum. Enable more students to incorporate sustainability and environmental education into their work. Build on existing assets to expand the College’s capacity for responsible resource management and sustainable development. Increase the effectiveness of College’s Lillian Anderson Arboretum as a learning lab for the campus and community. The Arthur Vining Davis Foundations are a major supporter of private colleges and universities like K, based on their conviction that “an educated society strengthens democracy through principled, thoughtful and compassionate leadership.” The Center for Environmental Stewardship is consistent with Kalamazoo College’s strategic vision of integrating academic rigor with life-changing experiential education in a values-driven community. Biology Department Chair Binney Girdler says the grant will allow the hiring of a dedicated director for the Center for Environmental Stewardship, a key element of launching a program with the breadth and depth envisioned. Girdler, whose duties include serving as faculty director of the arboretum, says environmental studies are nothing new at K — the subject has been an interdisciplinary minor for about 30 years, and both biology and chemistry classes make heavy use of the arboretum for those and other courses. She also says the College has a record of sustainability initiatives dating back at least to the launching of a recycling effort in the 1990s. In addition, the College is a signatory to the American College & University Presidents’ Climate Commitment. And in 2016, thanks to a grant from the Irving S. Gilmore Foundation, it opened the solar-powered Dr. H. Lewis Batts Jr. and Jean M. Batts Pavilion to help host programming at the arboretum. “So we’ve had these bubbles of passion around the campus, but no one person to get their arms around the whole thing and to really center it, and enrich it, and expand it,” Girdler says. The director, whose position will be half-time, “will be able to really do some connecting the dots and cultivating collaborations among” faculty in their classes, the College’s facilities staff, student organizations, the Arcus Center for Social Justice Leadership and the Mary Jane Underwood Stryker Center for Civic Engagement, she says. “It will be more than the sum of the parts,” she adds. Working with the director, she says, will be a student Environmental Leadership Corps, with paid positions dedicated to sustainability initiatives both on campus and involving the wider Kalamazoo community. She says those students will engage Kalamazoo-area residents “from pre-K to gray” through activities such as leading interpretive hikes at the arboretum, a 140-acre expanse of woods, meadows and marshes six miles from the College in Oshtemo Township. “We’ll be cultivating a corps of students who themselves have gained from their connections with the natural world and their understanding of sustainability, and having them lead others to the understanding that we’re all in this together,” Girdler says. Ultimately she expects efforts to acquaint students with environmental education and sustainability issues, and the related use of the arboretum, to spread far beyond science courses like the ones she teaches. She cites a music class that held a session at the arboretum, where it coaxed sound and rhythms from sticks, stones and other natural materials, and a philosophy class that used the forest to explore environmental themes. Grants will be available to faculty members across the College to help them design instructional modules that make use of the arboretum. Mathew Holmes-Hackerd ’20, a biology major, shares Girdler’s enthusiasm for the arboretum’s possibilities. He will be conducting a survey there this fall of the invasive species colonizing the former farmland, a 1982 gift to the College by the late Lillian Anderson ’26. This entry was posted in News Stories and tagged biology, chemistry, civic engagement, grants, social justice, student organizations, sustainability, . Bookmark the permalink.